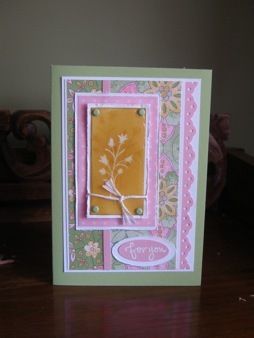 Crystal Effects Creates Wow Results on Cards & Scrapbook Pages. Achieve Great Effects With Crystal Effects. There are lots of ways Crystal Effects can be used in conjunction with your paper crafting. The simplest method is to cover your stamped image with a layer of the liquid to create a type of gel finish. 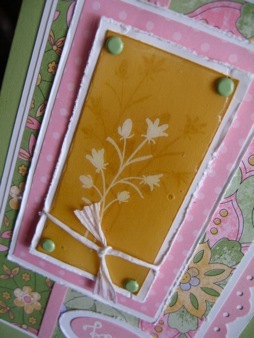 This card uses the lovely Pocket Silhouettes stamp set from Stampin Up. I've embossed the single image using white embossing powder & Versa Mark Ink, then stamped over that image with So Saffron Classic Ink a couple of times. Then I simply applied the Crystal Effects straight from the bottle and smoothed it out a little using the nozzle on the bottle. To construct the card, I chose DSP from the beautiful Tea Party range, layered various patterns with Whisper White Card and added a scalloped embellishment using the Eyelet Border Punch and Pretty in Pink card. Everything was then layered onto some Certainly Celery Card. Don't you just love how everything from Stampin Up co-ordinates so well? It makes card making and scrapping so easy as you can find reference to the colours used in the Designer Series papers in the Idea Book & Catalogue, then all you have to do is use those colours in your card stock to create a beautifully co-ordinated creation. You can see the effects achieved in the detail photo. Order Crystal Effects To Experiment On Your Own Papercraft.